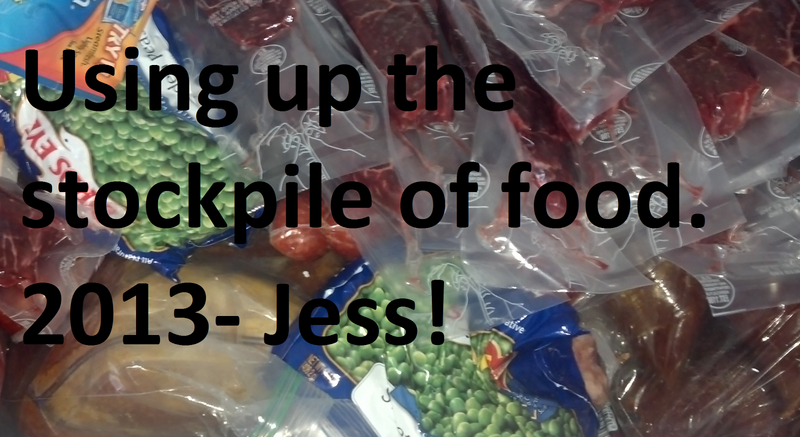 Beth Ann & Jessica's Helpful Savings: Using the Stockpile, Day 23: The Man is Out of Peanut Butter! 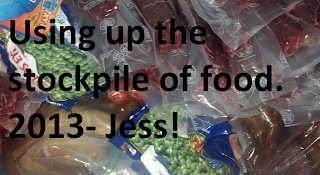 Using the Stockpile, Day 23: The Man is Out of Peanut Butter! I didn't cook anything today, since I cooked so much yesterday. Instead, I blogged, cleaned up the living room and kitchen, caught up on "Pretty Little Liars" online and got a workout in. Then, I had to go to work! I did make some Jello though. :) Tomorrow I've got to go to Sam's Club and get my husband his Jif. He's been out for a couple of days and won't eat the natural stuff. Oh well. :) Still under $100 for the month, right?? Goal: Spend under $100 for January. I beat my $50 ultimate goal by 21 cents on 1/22/13. Stockpile items demolished: 2 boxes of Kraft Mac & Cheese, 1 jar of Patak's Sauce, 1 bag of granola, 1 bag of protein powder, 1 rogue squash, 2 packages of chicken breast, 2 packages of Hormel deli pepperoni, 1 tube of crescent rolls, 4 packages of bacon, 4 bags of shredded cheese, 2 packages of Knorr rice sides, 2 big jars of Jif peanut butter, 1 jar of honey, 1 bag of flour, 1 box of crackers, 2 boxes of granola/snack bar, 4 freezer steaks, 2 bags of Gevalia coffee, 6 gallons of milk, 1 jar of Jif hazelnut spread, 1 jar of Planter's peanut butter, 6 boxes of cereal, 1 whole freezer chicken, 4 misc. beers, 2 boxes oatmeal, 1 jar almond butter, 3 cans of green beans, 2 bags frozen peas, 1 bag frozen broccoli, 2 cans chick peas, 1 jar of canned fruit, 1 remaining package of spanakopita, 1 remaining package of mozzarella sticks, 1 remaining package of jalapeno poppers, 1 remainder of a bag of french fries, 1 dozen eggs, 1 package frozen broccoli, 1 frozen Farmland pork sausage, 2 freezer bags of homemade pasta sauce, 2 pouches of Starkist tuna, 1 package of pork loin, 1 bottle A1 steak sauce, 2 boxes of Jello pudding, 1 can of mangos, 1 can of coconut milk, 1 can Bush's beans, 1 tub oatmeal, 1 box of Johnsonville Cheddar Bratwurst Patties, 1 can of black beans, 1 box of Fiber One Muffins, 1 box of Jello, frozen pretzels, 1 bottle salad dressing.